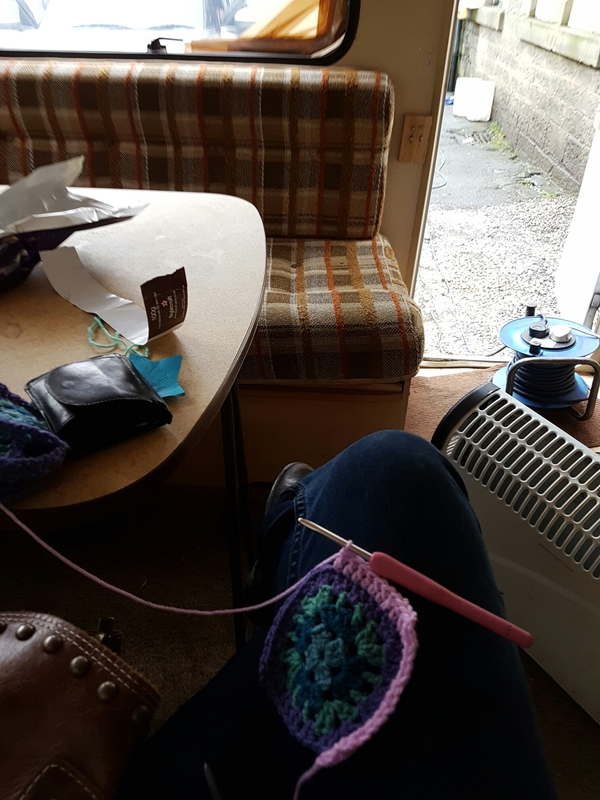 Crochet on the go! – That DARN Crochet! Obsessive crochet at home and on the go! I’m in the middle of an Attic 24 Harmony blanket. I’ve had the pack for ages but I’ve discovered I’m not keen on squares. We went to Center Parcs last week though, and I only took the pack with me so that I would be forced to finish it. At home I have too much yarn to choose from in my stash and too much inspiration online and in the million crochet books and magazines I own! Anyway whilst on our short break I polished off about 120 of the squares and I’ve been putting the remainder in my handbag for on the go crochet. I’ve dropped Leon off for his guitar lesson and am sat in an old caravan whilst my car gets a valet! You have to grab your yarn and get on with it where and when you can! I’ll update you with more when I finish up. Cosy stripe blanket with flower border.